BSNL to provide Free WiFi Broadband Internet services to Kochi Metro Trains passengers under Digital India program. After announcement of Budget 2016-17 under Digitalization of India, State run Telecom Company (BSNL) in association with Indian Railways offering Free WiFi Broadband connectivity to Kochi Metro Train passengers. 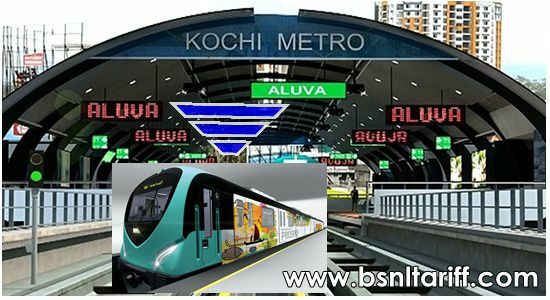 As per latest information from BSNL sources, Kochi Metro Rail Limited (KMRL) officials had discussions with BSNL authorities to provide BSNL’s High-Speed Internet Services to Kochi Metro Train passengers in all the 25 metro trains. Free WiFi services will be available initially from Aluva to Maharaja’s ground station. In a statement on this occasion speaking to media KMRL’s Managing Director said, ‘The BSNL facilitating excellent schemes, but we’re worried about Technical issues since connectivity can be assured only at stations. We’re striving to ensure seamless connectivity by overcoming technical challenges to facilitate connectivity in moving trains’. BSNL installed already Free Public WiFi Hotspots at Public places and Tourist places in the city of Kochi. Customers of any telecom operator can enjoy first 15 minutes Free WiFi internet service at Free of cost. Thereafter, customer has to purchase WiFi Data Topup vouchers to continue data usage. Customers having WiFi enabled device can access BSNL WiFi services upto 150 meters from the Access Point. To verify BSNL Free WiFi coverage, just turn on the WiFi on device and search for ‘QFI BSNL’ SSID.